In Slamming Spam, two spam fighters show you how to fight back—and win. 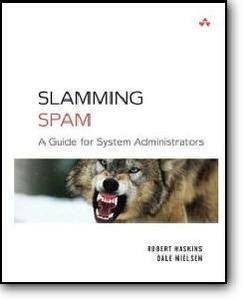 Unlike most spam books, this one is written specifically for in-the-trenches system administrators: professionals who need hands-on solutions for detecting, managing, and deterring spam in Unix/Linux and/or Microsoft Windows environments. The authors offer deep, administrator-focused coverage of the most valuable open-source tools for reducing spam's impact in the enterprise—especially SpamAssassin. Drawing on their extensive experience in developing and implementing anti-spam tools, the authors present expert insights into every leading approach to fighting spam, including Bayesian filtering, distributed checksum filtering, and email client filtering. Whatever your IT environment and mail platform, Slamming Spam's defense in-depth strategies can help you dramatically reduce spam and all its attendant costs—IT staff time, network/computing resources, and user productivity.